Back in 2016, Apple CEO Tim Cook made headlines after apologizing to consumers in China who were dissatisfied with unequal warranty and repair policies. In what was called an important step in mending relations between the company and the nation, Cook’s apology expressed appreciation for feedback from Chinese consumers and ensured the company harbored immense respect for its customers in China. While apologizing in such a public manner can be intimidating for many companies, admitting imperfection and offering to resolve a situation can mend, and even strengthen, connections with customers. 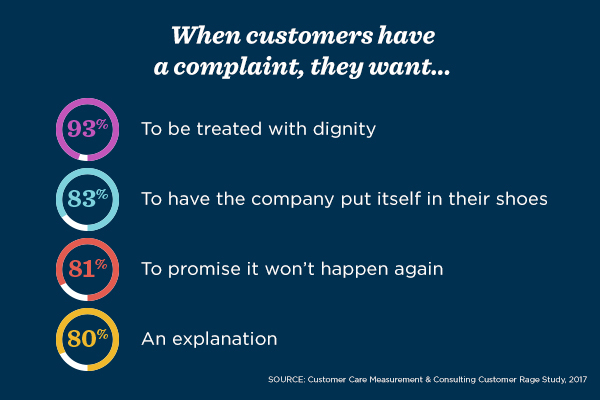 In 2017, Customer Care Measurement & Consulting conducted a study to find out what customers really wanted when they filed a complaint. The results may (or may not) surprise you. Infusing authenticity into customer communications is vitally important. One aspect to consider when humanizing your customer engagement is the sensitive topic of apologizing to customers or clients. Humans are imperfect, and so are companies. When mistakes happen that negatively impact customers, how companies address those mistakes determine whether they lose a customer for good or earn their trust back. If the apology is sincere and handled in a human, professional manner, sometimes the customer relationship can even strengthen after the mistake. 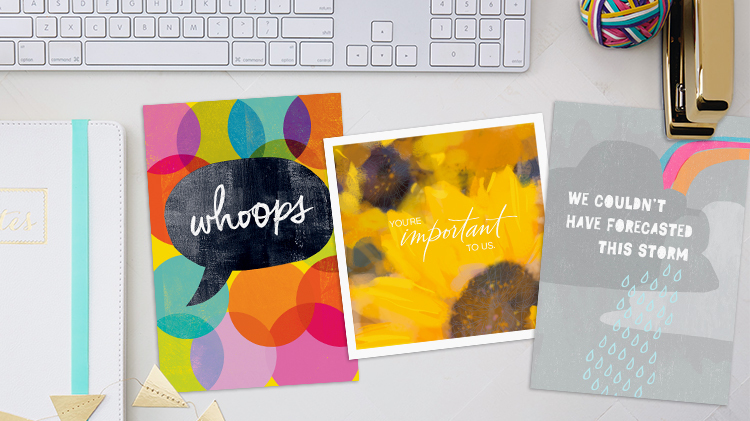 At Hallmark Business Connections, we provide a line of apology cards specific to the business setting. 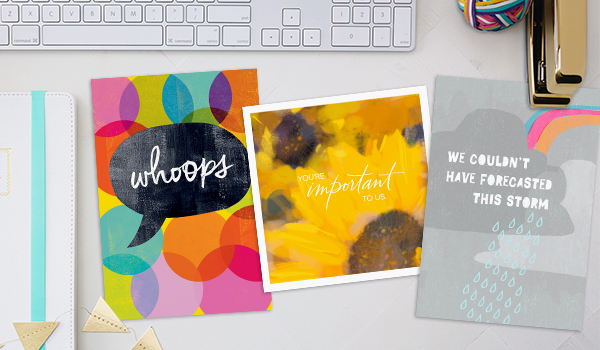 Personalized cards are a way to extend a heartfelt apology while forming an emotional connection with customers. As the image above notes, customers want two logical “fixes” and two emotional “fixes” when they encounter a problem. Although a card won’t be able to fix the logical aspects of the problem, it does heal the emotional wound that can be left after a slip up or mistake. 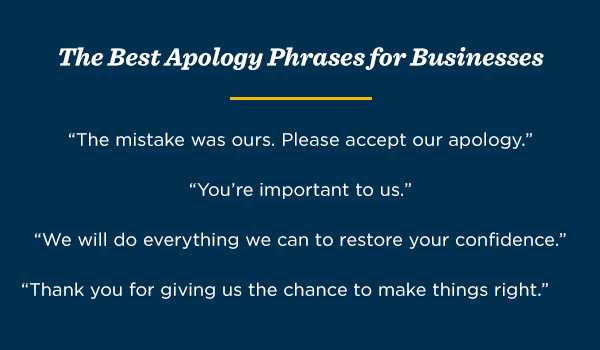 Here are a few other tips and tricks we have up our sleeves to help make apologizing to customers a little easier on your organization. When apologizing, first sincerely take accountability for the action. Nothing is worse than getting a half-hearted apology. Use phrases like “The mistake was ours. Please accept our apology.” Be direct, simple and honest. After taking accountability, express appreciation for the customer and address how things will change in the future. Instead of groveling, cap in hand, it is better to emphasize the importance of the relationship. Saying “You’re important to us” emphasizes that the customer relationship is your main priority and that your goal is to resolve the situation and ensure the customer is satisfied. Use future-focused language to imply steps will be taken to ensure the mistake does not happen again. Use sentiments such as “We will do everything we can to restore your confidence” and “Thank you for giving us the chance to make things right.” Offer appreciation for gaining a second chance. While apologizing to customers may make your company feel vulnerable, sometimes showing the imperfect, human side of your company can help bolster valuable connections with customers. By apologizing for mistakes in a forthright and timely manner, customers will appreciate the transparent manner in which you conduct your business, and hopefully give you another chance to earn their support.